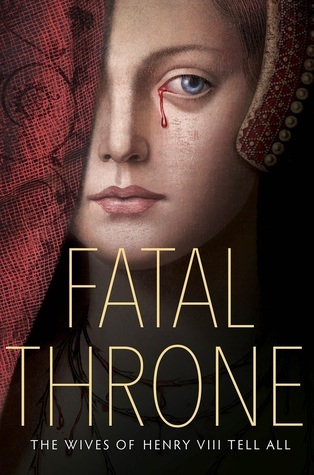 Fatal Throne, a book about Henry VIII and his six wives, coordinated by Candace Fleming. Fleming and six other authors will each contribute a story from different points of view: M.T. Anderson, Jennifer Donnelly, Stephanie Hemphill, Deborah Hopkinson, Linda Sue Park, and Lisa Ann Sandell. Back in the late 1990s and early 2000s, I used to like this punk band named Anne Boleyn. You should definitely do a Spotify search of “Anne Boleyn” to see all of the musical treasures in honor of her. This book gets five stars because I had a hard time putting it down. Riveting, like it says on the back cover, is an apt description of the novel. I was completely absorbed by each queen’s story, and I kept reflecting on the book every time I had to step away from it. The authors skillfully capture the psychological nuances of the queen’s and provide vivid and emotionally engaging portraits of their personalities. Whether you are a Tudor history-buff or a Tudor novice, I think you will be enthralled by these intimate snapshots of some of the most famous royal women in history. Again, this books gets five stars because it was hard to put down, and it was skillfully crafted. The book gets four stars, however, for the world-building and the added POV chapters of Henry VIII. Okay–I know this book is concerned with bringing to life historical actors, not world building. As the readers, we are left with knowledge of the queens’ inner thoughts before and after being ensnared by Henry. I love this. But if you have never read a book about Tudor history and/or 16th Century England, then you will have a difficult time picturing the royal court and the conditions that the queens lived in during this time period. More historical context in general would have been nice. I think the first chapter, Queen Katharine of Aragon’s chapter, was the most adequate for this aspect. A freaking Tudor-themed SUBSCRIPTION BOX, people!!! And would you look at that! This site has even created a playlist for you to shop to! Additionally, I was a little disappointed and, quite frankly, surprised to find that there were Henry VIII chapters featured after each queen. I saw the author panel for this book at TLA, in Dallas, TX, and it was pushed as a feminist piece of fiction. Like it was finally giving voice to the doomed queens and taking the spotlight off of Henry. While the Henry chapters help the reader get a strong sense of the pressures he was under to produce a male heir, and a sense of his entitled and childish behavior, it did not add a great deal to the story. In short, I think Henry should have been left out. Logistically, I see how it helped transition between each queen’s story. But it would have been a thousand times better if these transition chapters were written from the perspectives of the queen’s mothers, sisters, or brothers, etcetera. I think we’ve all had enough of Henry. Check out this website for the court records/transcripts of Anne Boleyn, fellow history lovers. Here is a great list (not completely exhaustive) of Tudor history in Television and film. I am going to share with you some of my favorite Etsy shops: Treasures for a Queen and RabbitwoodandReason. You are seriously going to love/hate me for this. Have you read Fatal Throne yet? If not, is it on your TBR List? I would love to hear your thoughts in the comments below! Enter to win my ARC of Fatal Throne below!